Creating a HTCondor grid mapfile. This document describes how to install the Glidein Workflow Managment System (GlideinWMS) VO Frontend for use with the OSG Glidein factory. This software is the minimum requirement for a VO to use GlideinWMS. This document assumes expertise with HTCondor and familiarity with the GlideinWMS software. It does not cover anything but the simplest possible install. Please consult the GlideinWMS reference documentation for advanced topics, including non-root, non-RPM-based installation. User Pool Collectors: A set of condor_collector processes. Pilots submitted by the factory will join to one of these collectors to form a HTCondor pool. User Pool Schedd: A condor_schedd. Users may submit HTCondor vanilla universe jobs to this schedd; it will run jobs in the HTCondor pool formed by the User Pool Collectors. Glidein Frontend: The frontend will periodically query the User Pool Schedd to determine the desired number of running job slots. If necessary, it will request the Factory to launch additional pilots. This guide covers installation of all three components on the same host: it is designed for small to medium VOs (see the Hardware Requirements below). Given a significant, large host, we have been able to scale the single-host install to 20,000 running jobs. CPU: Four cores, preferably no more than 2 years old. RAM: 3GB plus 2MB per running job. For example, to sustain 2000 running jobs, a host with 5GB is needed. Disk: 30GB will be sufficient for all the binaries, config and log files related to GlideinWMS. As this will be an interactive submit host, have enough disk space for your users' jobs. The default configuration uses a port range (9620 to 9660) for the secondary collectors. You can configure the secondary collectors to use the shared port 9618 instead; this will become the default in the future. For more detailed information, see Configuring GlideinWMS Frontend. The VO Frontend will use two credentials in its interactions with the other GlideinWMS services. At this time, these will be proxy files. the VO Frontend proxy (used to authenticate with the other GlideinWMS services). 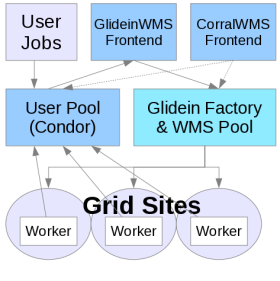 one or more GlideinWMS pilot proxies (used/delegated to the Factory services and submitted on the GlideinWMS pilot jobs). The VO Frontend proxy and the pilot proxy can be the same. By default, the VO Frontend will run as user frontend (UID is machine dependent) so these proxies must be owned by the user frontend. Both proxies need to be passwordless to allow automatic proxy renewal. The use of a service certificate is recommended. Then you create a proxy from the certificate as explained in the proxy configuration section. You must give the Factory operations team the DN of this proxy when you initially setup the Frontend and each time the DN changes. These proxies are used by the Factory to submit the GlideinWMS pilot jobs. Therefore, they must be authorized to access to the CEs (Factory entry points) where jobs are submitted. There is no need to notify the Factory operation about the DN of these proxies (neither at the initial registration nor for subsequent changes). These additional proxies have no special requirements or controls added by the Factory but will probably require VO attributes because of the CEs: if you are able to use one of these proxies to submit jobs to the corresponding CEs where the Factory runs GlideinWMS pilots for you, then the proxies are OK. You can test each of your proxies using globusrun or HTCondor-G.
To check the important information about a PEM certificate you can use: openssl x509 -in /etc/grid-security/hostcert.pem -subject -issuer -dates -noout. You will need that to find out information for the configuration files and the request to the GlideinWMS Factory. The exact spelling and capitalization of your VO name. Sometime is different from what is commonly used, e.g. OSG VO is "OSGVO". A string to add in the main Factory query_expr in the Frontend configuration, e.g. stringListMember("VO",GLIDEIN_Supported_VOs). This is used to select the entries you can use. From there you get the correct name of the VO (above in this list). This will install the current production release verified and tested by OSG with default HTCondor configuration. This command will install the GlideinWMS vofrontend, HTCondor, the OSG client, and all the required dependencies all on one node. yum install --enablerepo=osg-testing glideinwms-vofrontend: The most recent production release, still in testing phase. This will usually match the current tarball version on the GlideinWMS home page. (The osg-release production version may lag behind the tarball release by a few weeks as it is verified and packaged by OSG). Note that this will also take the osg-testing versions of all dependencies as well. yum install --enablerepo=osg-upcoming glideinwms-vofrontend: The most recent development series release, i.e. version 3.3 release. This has newer features such as cloud submission support, but is less tested. Note that these commands will install default HTCondor configurations with all GlideinWMS services on one node. On the vofrontend and userschedd, modify CONDOR_HOST to point to your usercollector. This is in /etc/condor/config.d/00_gwms_general.config. You can also override this value by placing it in a new config file. (For instance, /etc/condor/config.d/99_local_custom.config to avoid rpmsave/rpmnew conflicts on upgrades). In /etc/condor/certs/condor_mapfile, you will need to add the DNs of each machine (userschedd, usercollector, vofrontend). Take great care to escape all special characters. Alternatively, you can use the glidecondor_addDN to add these values. In the /etc/gwms-frontend/frontend.xml file, change the schedd locations to match the correct server. Also change the collectors tags at the bottom of the file. More details on frontend.xml are in the following sections. The VO Frontend configuration file is /etc/gwms-frontend/frontend.xml. The next steps will describe each line that you will need to edit if you are using the OSG Factory at UCSD. The portions to edit are highlighted in red font. If you are using a different Factory more changes are necessary, please check the VO Frontend configuration reference. The classad_proxy in the security entry is the location of the VO Frontend proxy described previously here. The proxy_DN is the DN of the classad_proxy above. The security_name identifies this VO Frontend to the the Factory, It is provided by the Factory operator. The absfname in the credential entry is the location of the GlideinWMS pilot proxy described in the requirements section here. There can be multiple pilot proxies, or even other kind of keys (e.g. if you use cloud resources). The type and trust_domain of the credential must match respectively auth_method and trust_domain used in the entry definition in the Factory. If there is no match, between these two attributes in one of the credentials and the corresponding ones in some entry in one of the Factories, then this Frontend cannot trigger glideins. Both the classad_proxy and absfname files should be owned by frontend user. The DN of the VO Frontend Proxy described previously here. The fullname attribute is the fully qualified domain name of the host where you installed the VO Frontend (hostname --fqdn). A secondary schedd is optional. You will need to delete the secondary schedd line if you are not using it. Multiple schedds allow the Frontend to service requests from multiple submit hosts. <schedd DN="Cert DN used by the schedd at fullname:"
<schedd DN="Cert DN used by the second Schedd at fullname:"
The secondary attribute indicates whether the element is for the primary or secondary collectors (True/False). The default HTCondor configuration of the VO Frontend starts multiple Collector processes on the host (/etc/condor/config.d/11_gwms_secondary_collectors.config). The DN and hostname on the first line are the hostname and the host certificate of the VO Frontend. The DN and hostname on the second line are the same as the ones in the first one. The hostname (e.g. hostname.domain.tld) is filled automatically during the installation. The secondary collector connection can be defined as sinful string for the sock case , e.g., hostname.domain.tld:9618?sock=collector16. <collector DN="DN of main collector"
<collector DN="DN of secondary collectors (usually same as DN in line above)"
In GlideinWMS v3.4.1, shared port only configuration is incompatible if talking to older Factories (v3.4 or older). We strongly recommend any user of GlideinWMS Frontend v3.4.1 or newer, to transition to the use of shared port for secondary collectors and CCBs. The shared port configuration is incompatible if your Frontend is talking to Factories v3.4 or older and you'll get an error telling you to wait. To transition to the use of shared port for secondary collectors, you have to change the collectors section in the Frontend configuration. If you are using the default port range for the secondary collectors as shown in [Example 2] below, then you should replace it with port 9618 and the sock-range as shown in [Example 1] above. The CCBs information. If you have a different configuration of the HTCondor Connection Brokering (CCB servers) from the default (usually the section is empty as the User Collectors acts as CCB if needed), you can set the connection in the CCB section the same way that User Collector information previously mentioned. Also, the same rules for transition to shared_port of the connections, apply to the CCBs. <ccb DN="DN of the CCB server"
replace [email protected] and gfactory-1.t2.ucsd.edu with the correct values for your Factory. And control also that the name used for the Frontend () matches. make sure that the Factory is advertising the attributes used in the Factory query expression (query_expr). The HTCondor configuration for the Frontend is placed in /etc/condor/config.d. The above procedure will work if you are using the OSG HTCondor RPMS. You can verify that you used the OSG HTCondor RPM by using yum list condor. The version name should include "osg", e.g. 8.6.4-3.osg.el7. If, like in the example above, the GlideinWMS configuration files are not the last ones in the list please verify that important configuration options have not been overridden by the other configuration files. The GlideinWMS configuration files in /etc/condor/config.d should be the last ones in the list. If not, please verify that important configuration options have not been overridden by the other configuration files. Defined in '/etc/condor/config.d/11_gwms_secondary_collectors.config', line 193. If you don't see all the collectors. shared port and the two schedd, then the configuration must be corrected. There should be no startd daemons listed. Below is an example mapfile, by default found in /etc/condor/certs/condor_mapfile. In this example there are lines for each of services mentioned above. If you do not have access to the vo's voms_cert and voms_key, contact the VO manager. Due to the retirement of VOMS Admin server in the OSG, use_voms_server = false is the preferred method for signing VOMS attributes. You must report accounting information if you are running more than a few test jobs on the OSG . Edit the ProbeConfig located in /etc/gratia/condor/ProbeConfig. First, edit the SiteName and ProbeName to be a unique identifier for your GlideinWMS Submit host. There can be multiple probes (with different names) per site. If you haven't already, you should register your GlideinWMS submit host in OIM. Then you can use the name you used to register the resource. The following sections contain additional configuration that may be required depending on the customizations you've made to your GlideinWMS frontend installation. If you have users that submit jobs without a certificate explicitly declared in the submit file, you will need to add MapUnknownToGroup to the ProbeConfig. In the file /etc/gratia/condor/ProbeConfig, add the value after the EnableProbe. Further, if you want to record all usage as coming from a single VO, you can configure the probe to override the 'guessed' VO. In the below example, replace the Engage with a registered VO that you would like to report as. If you don't have a VO that you are affiliated with, you may use Engage. If HTCondor is installed in a non-standard location (i.e., not RPMs, or relocated RPM outside /usr/bin), then you need to tell the probe where to find the HTCondor binaries. This can be done with a script with a special attribute in /etc/gratia/condor/ProbeConfig, CondorLocation. Point it to the location of the HTCondor install, such that CondorLocation/bin/condor_version exists. The following configuration steps are optional and will likely not be required for setting up a small site. If you do not need any of the following special configurations, skip to the section on service activation/deactivation. To perform configuration changes without impacting production the recommended way is to create an ITB group in /etc/gwms-frontend/frontend.xml. This groupwould only match jobs that have the +is_itb=True ClassAd. Create a group named itb. The complete validation of the Frontend is the submission of actual jobs. However, there are a few things that can be checked prior to submitting user jobs to HTCondor. There are a few things that can be checked prior to submitting user jobs to HTCondor. Verify all HTCondor daemons are started. Verify all VO Frontend HTCondor services are communicating. To see the details of the glidein resource use condor_status -subsystem glideresource -l, including the GlideFactoryName. Verify that the Factory is seeing correctly the Frontend using condor_status -pool <FACTORY_HOST> -any -constraint 'FrontendName=="<FRONTEND_NAME_FROM_CONFIG>"' -l, including the GlideFactoryName. Then you can control the job like a normal HTCondor job, e.g. to check the status of the job use condor_q. Here a short list of files to check when you change the certificates. Note that if you renew a proxy or certificate and the DN remains the same no configuration file needs to change, just put the renewed certificate/proxy in place. If using HTCondor RPM installation, e.g. the one coming from OSG. If you have separate/multiple HTCondor hosts (schedds, collectors, negotiators, ..) you may have to check this file on all of them to make sure that the HTCondor authentication works correctly. If using the Frontend configuration and scripts described above in this document. These paths are the ones specified in the configuration file. If service gwms-frontend reconfig fails at the end with an error like "Writing back config file failed, Reconfiguring the frontend [FAILED]", make sure that /etc/gwms-frontend/ belongs to the frontend user. It must be able to write to update the configuration file. If the startup script of the frontend is failing, check the log file for errors (probably /var/log/gwms-frontend/frontend/frontend.TODAY.err.log and .debug.log). If you find errors like "Exception occurred: ... 'ExpatError: no element found: line 1, column 0\n']" and "IOError: [Errno 9] Bad file descriptor" you may have an empty status file (/var/lib/gwms-frontend/vofrontend/monitor/group_*/frontend_status.xml) that causes GlideinWMS Frontend not to start. The glideinFrontend crashes after a XML parsing exception visible in the log file ("Exception occurred: ... 'ExpatError: no element found: line 1, column 0\n']"). Remove the status file. Then start the frontend. The Frontend will be fixed in future versions to handle this automatically. code 256:['Error: communication error\n', 'AUTHENTICATE:1003:Failed to authenticate with any method\n', 'AUTHENTICATE:1004:Failed to authenticate using GSI\n', "GSI:5006:Failed to authenticate because the subject '/DC=org/DC=doegrids/OU=Services/CN=devg-3.t2.ucsd.edu' is not currently trusted by you. If it should be, add it to GSI_DAEMON_NAME in the condor_config, or use the environment variable override (check the manual).\n", 'GSI:5004:Failed to gss_assist_gridmap /DC=org/DC=doegrids/OU=Services/CN=devg-3.t2.ucsd.edu to a local user. A possible solution is to comment/remove the LOCAL_CONFIG_DIR in the file /var/lib/gwms-frontend/vofrontend/frontend.condor_config. You may see a warning like "No security credentials match for factory pool ..., not advertising request", if the trust_domain and auth_method of an entry in the Factory configuration is not matching any of the trust_domain, type couples in the credentials in the Frontend configuration. This causes the Frontend not to use some Factory entries (the ones not matching) and may end up without entries to send glideins to. To fix the problem make sure that those attributes match as desired. If the Frontend http server is down in the glidein logs in the Factory there will be errors like "Failed to load file 'description.dbceCN.cfg' from http://FRONTEND_HOST/vofrontend/stage." To get assistance about the OSG software please use this page. To request access the OSG Glidein Factory (e.g. the UCSD factory) you have to send an email to osg-gfactory-support@physics.ucsd.edu (see below). The Glidein WMS Frontend installation will create the following users unless they are already created. apache 48 Runs httpd to provide the monitoring page (installed via dependencies). frontend none This user runs the glideinWMS VO frontend. It also owns the credentials forwarded to the factory to use for the glideins. UID 48 is reserved by RedHat for user apache. If it is already taken by a different username, you will experience errors. This document has a proxy configuration section that uses the host certificate/key and a user certificate to generate the required proxies. The VO frontend must have reliable network connectivity, be on the public internet (no NAT), and preferably with no firewalls. Incoming TCP ports 9618 to 9660 must be open.